Using the Safari browser on your iPad, you can search the web via Google, Yahoo!, Bing, or DuckDuckGo. If you’ve added a foreign language keyboard, other options may present themselves. For example, with a Chinese keyboard enabled, you can summon the Baidu search engine. You can search also for people and programs across your iPad and within specific apps, using a combination of Spotlight and Siri. Searching across the iPad is based on the powerful Spotlight feature familiar to Mac owners. Spotlight can search for news and trending topics, local restaurants, movie times, and content in Apple’s own iTunes Store, App Store, and iBooks Store. Moreover, with Siri teaming up with the Spotlight feature (familiar to Mac owners), you’ll also see circled icons representing the contacts you engage with the most, the people you are next scheduled to meet, as well as nearby eateries, shops, and other nearby places of possible interest. The searches are also proactive, meaning that the device gets to know you over time and makes suggestions accordingly. It attempts to read your mind. The tablet might surface the News app for example, if it learns that you turn to it every morning (while enjoying your coffee). Or if you’re in a particular area, you may see the news that’s trending in your location. Swipe down from any screen to access search. A bar slides into view at the top of the screen. Tap the bar and use the virtual keyboard to enter your search query. The iPad spits out results the moment you type a single character; the list narrows as you type additional characters. The results are pretty darn thorough. Say that you entered Ring as your search term. Contacts whose last names have Ring in them show up, along with friends who might do a trapeze act in the Ringling Bros. circus. All the songs on your iPad by Ringo Starr show up too, as do such song titles as “Ring-A-Ling,” from the Black-Eyed Peas if that happens to be in your library. The same goes for apps, videos, audiobooks, events, and notes with the word Ring. You’ll see web and App Store references as well. Tap any listing to jump to the contact, ditty, or app you seek. Putting the Spotlight on search. 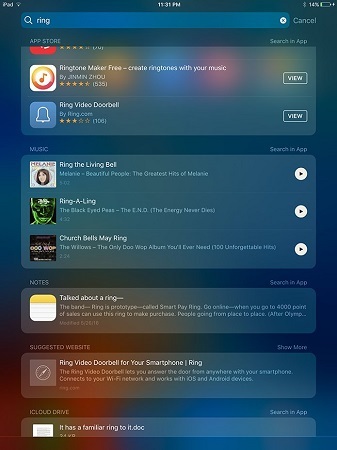 You can enable Spotlight Suggestions under Spotlight Search settings to summon results from the web, iTunes, App Store, movie showtimes, nearby locations, and more. Separate switches in Settings let you enable Spotlight Suggestions when searching or when taking advantage of the Look Up feature.